• Beginning with a complimentary consultation with our couple, we find out their hopes and ideas for the special day, along with getting to know their personality and style. They may bring collections of ideas and fabric swatches i or maybe an organization of special ideas on a pinterest board. Sharing these ideas, along with conversation, will give us a very good idea of what you, as a couple are envisioning for wedding stationery and help us bring these ideas to life on paper in the form of an invitation! Design services, from save the dates, wedding invitations to the day-of stationery which includes programs, menus, seating cards, table numbers & favor tags through to the thank you card - the last time your guests will enjoy seeing your wedding design. 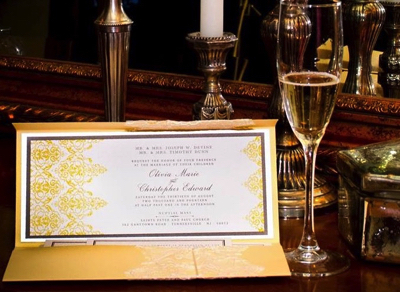 Leave your guests with a lasting impression, with a keepsake invitation. • After the consultation, a proposal, describing your wants + needs, along with pricing, is drawn up. Many things are factored in the pricing, such as quantity, type of printing, paper quality/color, custom illustration & design, hand-done details. Each stationery design is unique so pricing varies from project to project. • After the proposal is reviewed & approved and a 50% non-refundable deposit is made, the design process will begin. Our designers, will take your discussion ideas and begin the creative process of designing two invitation options, emailed to you as a PDF file to be reviewed and collaborated with. Up to three rounds of revisions will be allowed, and once a version has been approved, it will be processed into ‘final digital proof’ for sign off. • Printing will take place only after your final approval, at which time you will review and confirm that every detail is perfect: layout, font, spelling, grammar and punctuation. Once you have approved the digital proof, little pearl designs is not responsible for any future changes or mistakes. The remainder of the balance is due before going to print. Delivery is usually within 2-3 weeks of going to print. • Design work and the printing of day-of stationery - programs, place cards, menus, table numbers & thank you cards, takes place after invitation is completed. • We suggest starting a custom design process 5-6 months prior to your mailing date.